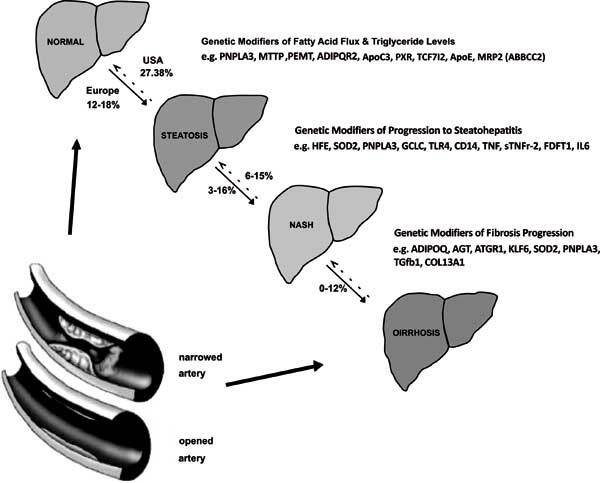 Non-alcoholic fatty liver disease (NAFLD) is the most common liver disease (30% of the general population) and up to 40% of cases advance to the more severe form of the disease: nonalcoholic steatohepatitis (NASH), which is causally related to cirrhosis and cardiovascular disease (CVD). There is no generally accepted effective treatment for NAFLD/NASH. The joint guidelines of the European Association for the Study of the Liver (EASL), the European Association for the Study of Diabetes (EASD) and the European Association for the Study of Obesity (EASO) suggest the “off label” use of pioglitazone in patients without type 2 diabetes mellitus (T2DM) and pioglitazone in subjects with T2DM or vitamin E or their combination for the treatment of NASH; however pioglitazone has considerable limitations: weight gain, bone fractures in women, and heart failure. The aim of this narrative review is to assess the existing evidence supporting statin use for the treatment of NASH and the reduction of the high CVD risk of these patients. Animal data suggest that there is some benefit from statin use in liver histology in models of NASH. In humans, 3 post hoc analyses of randomised controlled trials (n=1,600, n=1,123, n=8,864) suggest that the use of atorvastatin (even in 80 mg/day) has a beneficial effect on NAFLD/NASH, in terms of liver enzyme reduction and ultrasonographic amelioration. Moreover, and most importantly, statin treatment halved CVD morbidity and mortality in statin-treated NAFLD/NASH patients compared with statin-treated participants with normal liver structure and function and reduced by 2/3rds CVD events in comparison with NAFLD/NASH patients that were not on a statin (90% of this population is not on statins because of the unjustified fear for liver damage). Three biopsy studies (n=20, n=107 and n=356) showed that statin treatment had a protective effect on steatosis, steatohepatitis and fibrosis. Data suggest that statin treatment in humans substantially improve or cure NAFLD/NASH, but above all substantially reduce CVD morbidity and mortality. Administration of potent statins appears safe and effective in saving lives in NAFLD/NASH patients. Keywords: Non-alcoholic fatty liver disease, non-alcoholic steatohepatitis, cardiovascular disease, statins, metabolic syndrome, diabetes mellitus. Keywords:Non-alcoholic fatty liver disease, non-alcoholic steatohepatitis, cardiovascular disease, statins, metabolic syndrome, diabetes mellitus. Abstract:Non-alcoholic fatty liver disease (NAFLD) is the most common liver disease (30% of the general population) and up to 40% of cases advance to the more severe form of the disease: nonalcoholic steatohepatitis (NASH), which is causally related to cirrhosis and cardiovascular disease (CVD). There is no generally accepted effective treatment for NAFLD/NASH. The joint guidelines of the European Association for the Study of the Liver (EASL), the European Association for the Study of Diabetes (EASD) and the European Association for the Study of Obesity (EASO) suggest the “off label” use of pioglitazone in patients without type 2 diabetes mellitus (T2DM) and pioglitazone in subjects with T2DM or vitamin E or their combination for the treatment of NASH; however pioglitazone has considerable limitations: weight gain, bone fractures in women, and heart failure.